Chiang Mai: It is a city in northern Thailand, arguably the best city in Thailand, second to Bangkok in size. They say Chiang mai has everything Bangkok can offer at a lower price and in cleaner settings. It is where many Europeans have settled down to a few years of quiet life in Thailand. I have lived in this city and it is one of the best there is in Thailand. The city is surrounded by mountains, you are never far away from beautiful nature. People get friendlier here. I’ve not seen a more friendlier and quiet people than here. 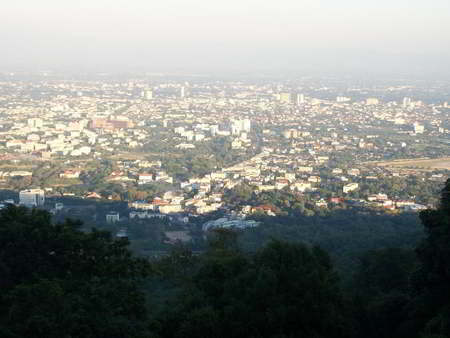 The main spots of Chiang mai are Nimmanheamin rd, the central mall near the airport and the mountains. 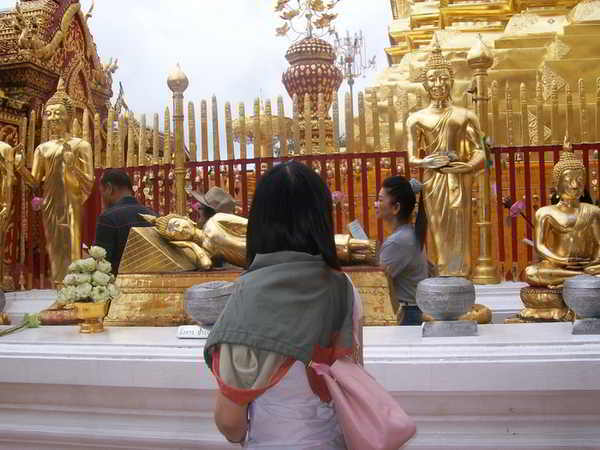 Doi suthep temple up the mountains is a must see. you could ride up the mountain to reach this beautiful temple. the view from the temple is awesome, you can see the whole of Chiang mai from there. This was a secretive temple built by the Buddhist monks in the hill overlooking the modern city of Chiangmai, they say the journey is as important as the destination. 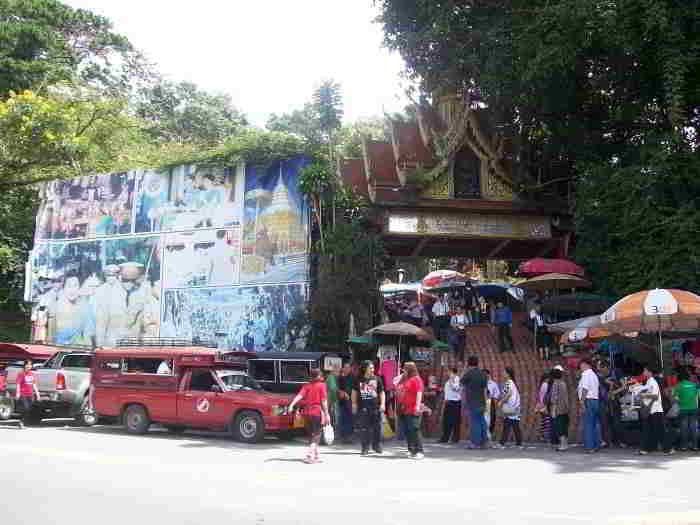 Going up the hill to this temple is a very enjoyable experience, you can do it in two ways, one take a songtaew which is a red Thai taxi or hire a motorbike from Bikky’s or Buddy’s bike rentals and ride up the Doi Suthep hill. The views on the way are breath taking I’ve posted some pictures here. On the way there are several waterfalls. There is one near “Skadagami”, you’ll see a sign post there. Ensure you take a powerful motorbike as the ride is steep. Tiger Kingdom: Pet an adult tiger here. it is inspiring to be so close to a tiger. The place is like a zoo, but they let you in to the cage with the tigers and a trained zoo keeper watches over. You can take pictures inside the enclosures and have buffet lunch here for 200 bahts. The cost of admission varies with the age of the tiger. To play with the new born tigers (2 to 3 months old) and smaller tigers (4 to 8 months old),it costs 620 bahts for 10 min in the enclosure. If you prefer to play with the older tigers (9 to 30 months old) adolescent to fully grown tigers, it costs 420 bahts for 15 min in the enclosure. Surely lesser number would prefer to play with a grown up tiger. The tigers are not drugged or tranquilized, there are no animal abuses, the park claims to show that tigers are not naturally aggressive animals. I had fun playing with a adolescent tiger, it felt like playing with an overgrown domestic cat. How to get there: If you are a tourist hire a cab or car rental. It shouldn’t cost you more than 800 bahts a day to go around Tiger kingdom, elephant rides at Mae sa and up into the mountain for a snake show. The best way would be to get a motorbike and enjoy the ride. you can get one for less than 200 bahts a day. where to get a good reliable bike rental in chiangmai. A motorbike offers more freedom with your schedule and you can choose to go wherever you want to. 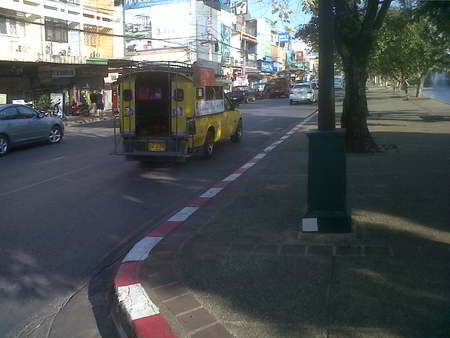 Chiangmai has relatively less traffic than Bangkok. Another option is a red taxi, a SONGTAEW in Thai, which is a shared taxi. That should cost much lesser not more than 200 bahts per person. Awesome place to play with Tigers in a safe environment. Tiger kingdom also offers a nice buffet and combo packages where you could play with a young tiger and an older tiger for a lesser price. Watch these videos of Tiger kingdom. I would say that this is a must visit place when you’re in Chiang mai. 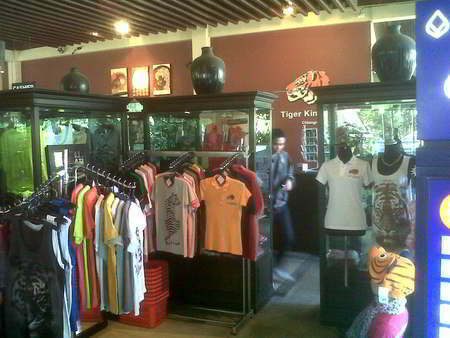 You can buy Tiger Kingdom merchandise from their souvenir shop (picture on the left). They have t-shirts, caps, key chains, magnets and postcards. I bought a cap that cost me 189 bahts. There is an ATM in the shop in case you run out of cash. Chiang mai offers Thailand’s best elephant camps and Maevang elephant camp is certainly one of the best. For 300 bahts you can ride an elephant into the jungle for an hour, that’s 300 for up to 2 people. Half a day riding and bathing the elephant costs 1500 bahts and a full day of riding, bathing and mountain hiking costs 2400 bahts. Train to be a mahout in one day. This unique program offers an approval certificate at the end of the program, all the trainers speak English. The price includes pick up and drop from hotel, Bananas and sugarcane for the elephant, lunch for the visitor, tea/coffee and accident insurance. The camp gives one traditional Mahout shirt, Northern Thai style, for you to flaunt your elephant riding skills and a Photo CD with pictures taken of the visitor. Both the Mahout shirt and the CD are complementary. Become a mahout + adventure in the jungle: This awesome tour starts at your hotel, the pick up from where you are staying is at 8-8:30 am. Once at the Maevang elephant camp, you get on your elephant, ride through the mountains to the Hmong and Karen hill tribe villages. For about 30 min you ride through the village towards the waterfalls, the break at the waterfalls allows a natural shower at the falls and then have lunch at a local restaurant in a Shan village. Finally, the best part is you get to ride a bamboo raft on the Maevang stream for half an hour. Was it fun? leave your comments and let us know once you do this trip. The 2 day version of this tour has all the above plus a night at the Karen village, mountain hiking and trek to the White Karen hill tribe village. To me this has got to be the best adventure up north in Thailand. Don’t forget to get your camera. Shopping in Chiangmai can be classified into malls and markets. The most popular malls are Kad Suan Kaew mall on Huay Kaew road and Central airport plaza near the airport. Kad Suan Kaew mall sells clothes,shoes, food, electronics, mobiles and has banks. They have a Mc Donalds, Pizza hut, Swensens, Tops and an impressive food court. Outside Kad Suan Kaew mall you can find temporary stalls selling clothes, perfumes and women’s accessories. The stuff sold outside the mall in the evenings is certainly a good bargain. New t-shirts and shorts for around a 100 bahts.Locally made perfumes are sold for 30 bahts onwards. Many of these perfumes are replicas of well-known brands. 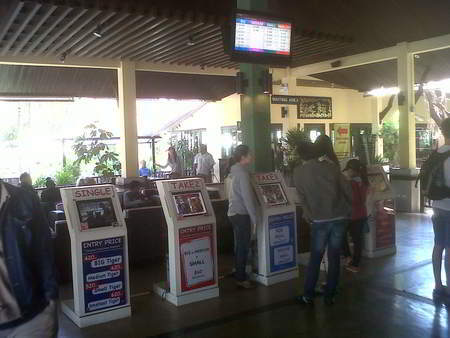 There are pet shops, pet grooming shops and a locksmith along the parking area in the mall. Angel Shih Tzu is a good pet shop where you can buy a Shih Tzu and other dogs and cats. 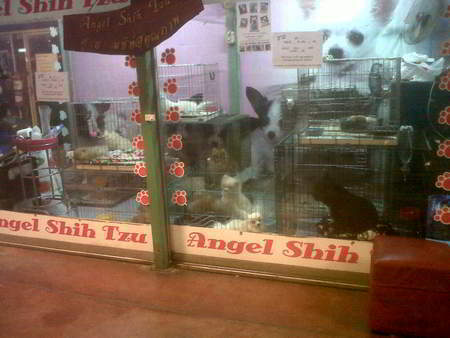 There are 2 other pet shops next to Angel’s. 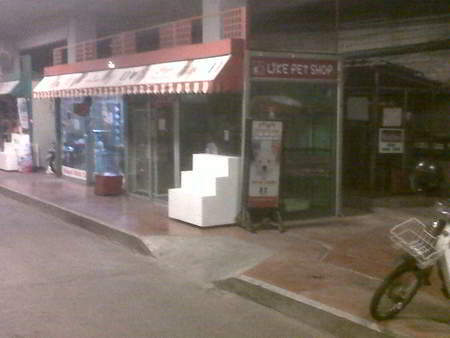 If you have a pet and want to give it a makeover go to the grooming shop in the parking area of Kad Suan Kaew mall as in the picture below. Malin market is open for business in the evenings. This is like a market selling food, clothes, eye glasses, music cd and DVDs. The interesting thing about Malin is that it has a nice vibrant atmosphere. It is very popular with Thais and expats alike. you can find any food from Asia here from Japanese to Indian. a very nice place to walk through in the evenings. Across Malin market is the iconic Boat restaurant, read about Boat and top restaurants in Chiang mai. 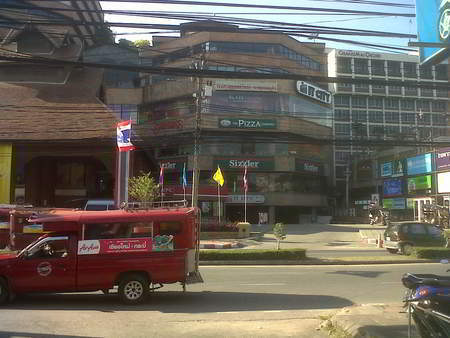 As you come out of the Chiang mai Airport, there is this huge mall right at the intersection. Central is the trendier mall in Chiang mai, definitely upscale mall with plenty of restaurants, a convention center which hosts frequent events like the international cat show. It has all the usual stuff and some expensive brands. Good to hangout and shop. Check their events calender and something interesting could be there in the weekends. Central also has movies. [wptab name=’Night bazar’]3. The Night Bazar: It is a touristy night market that has food, artists who can make a portrait and good massage parlors here. you can get good clothes for not much here, a very good place to buy souvenirs and Indian food in Chiang mai. Wat (temple) Chedi Luang has the tallest Chedi of all temples in Chiangmai. Wats in Chiang mai have a distinct Lanna (northern Thailand)feel to them. The mythical serpents resembling Chinese dragons can be found on the temple designs. Chedi is a Stupa which is a dome-like or semi-hemispherical structure containing Buddhist relics, typically the ashes of Buddhist monks, used by Buddhists as a place of meditation. The name of this temple seems to have come from its Chedi. Wat Chedi Luang is over half a century old, it was thought to have been damaged in an earthquake in the 15th Century. The word Chedi is also used in India referring to a ruling dynasty with the same name. Thai temples can be fascinating if you draw parallels to the Indian culture and origins of Buddhism. Definitely a must see. Wat Chedi Luang is a classical example of Lanna-style temples. How to go there: Take a songtaew or red taxi and say “wat Chedi luang” it is right inside the moat. Food in Chiangmai: Thais usually eat rice, noodles, soups, fried meats, lots of vegetables and fruit.The local favorite is Pad Kapao which is stir fried meat in Thai sauces with basil spread on top of steamed rice. It is also my favorite, it is often served with an omelet and a bowl of clear soup(stock). Most Thai servings of food are small when compared to the western portions. So a meal would be a couple of dishes or more. Thankfully the prices are low. a serving of Pad Kapao is usually about 30 Bahts (USD 1). Pad Thai which is Thai style stir fried noodles is another favorite, it is made with glass noodles or sheet noodles stir fried with shrimp, egg and sprouts. you can choose any meat like pork Pad Thai or beef Pad Thai. A serving of Pad That is usually 30 bahts (USD 1) in Chiang mai. 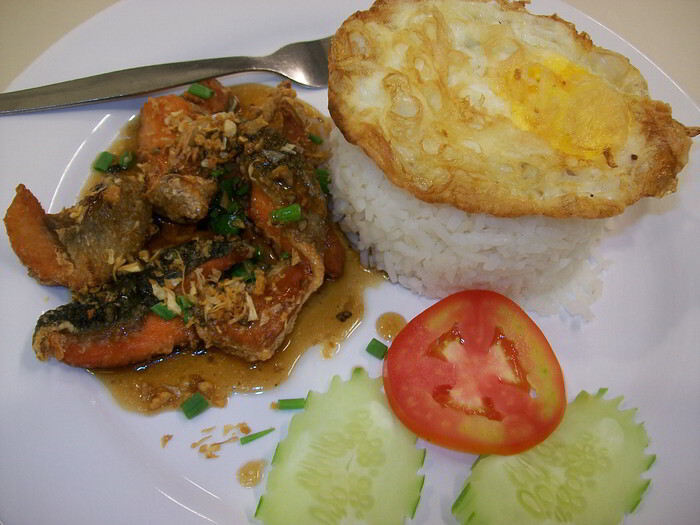 Some of the suggested places to eat are Kad suan kaew mall, Malin plaza and near Chiang mai university. There is also a nice little restaurant near the railway station. A great value for money eatery is Brownie’s in chiang mai. They have a buffet for 100 bahts (USD 3.3). The buffet has unlimited barbequed meats, noodles, salads, desserts and you can order drinks. It is my favorite eatery in Chiang mai. 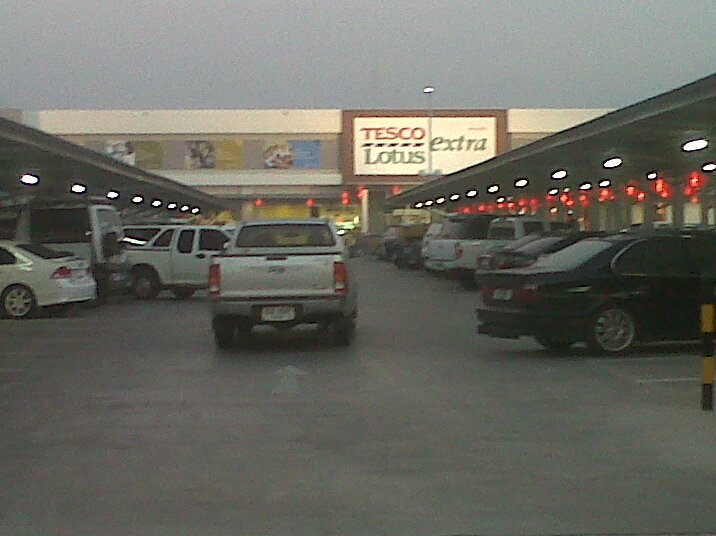 Tesco the British retailer has many retail outlets all over Thailand. It is your one stop shop for daily needs, groceries and discounted stuff. So what if you decide you want to live longer than the average tourist, you’ll have extend your Thai visa. This can be done by going to a neighboring country like Laos or Cambodia or Myanmar and getting a new Thai visa to stay another month. you’ll have to check with the Thai immigration about the visa because some nationalities like Indians, Bangladeshis, Pakistanis have to go back to their country to get a visa or change their visa. Pingback: Going to Thailand from India-Should you buy a Thailand tour package?